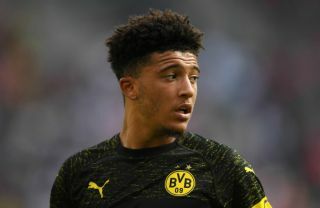 Man Utd have seemingly received a transfer blow as Borussia Dortmund sporting director Michael Zorc has responded to talk of a Jadon Sancho exit. The 19-year-old is having a stellar season this year, scoring nine goals and providing a staggering 17 assists in 35 appearances for the Bundesliga giants. He also earned his first England start last week, registering an assist in a big win over the Czech Republic as he continues to suggest that he has a very bright future ahead of him for club and country. As noted by Sky Sports, rumours have suggested that Sancho has emerged as a £100m transfer target for the Red Devils this summer, but it seems as though Dortmund aren’t taking much notice of the speculation. “I have no knowledge [of it], but it is also completely irrelevant,” Zorc told Bild, as quoted by Sky Sports in the report above. Further, it adds that Zorc has previously stated: “I’m far from putting a price tag on Jadon, but I will say that, even for the biggest club in the world, his transfer would be difficult right now. That would suggest that Man Utd could have a difficult time in prising the England starlet away from Dortmund this summer, and perhaps may have to play a waiting game to snap him up in the future. What is clear is that the decision to leave Man City and move to Germany is paying off, as Sancho has relished having a prominent role and regular playing time to continue his development. United have several options in the final third currently with the likes of Marcus Rashford, Romelu Lukaku, Anthony Martial, Jesse Lingard, Juan Mata and Alexis Sanchez all vying for positions. With that in mind, a sacrifice would surely have to be made in order to create space in the squad for Sancho, if of course an agreement can even be reached with Dortmund to sign the talented youngster as judging by Zorc’s comments, they may not even entertain the idea this year.